Bright white light is great when working or performing a specific task but often a softer tone or secondary colour is desired. 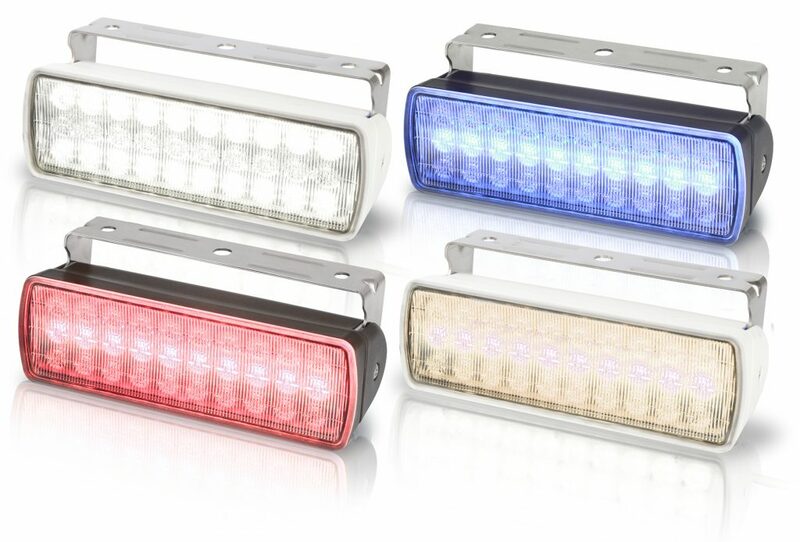 Owners can now benefit from two alternating LED hues with the new Dual Colour Sea Hawk-XL lamps from Hella marine. Measuring 170mm W x 68mm H x 58mm D these stylish lamps keep a low profile. Two rows of bright white LEDs producing 750 lumens for working, docking, diving or fishing. A third row of alternate colour LEDs increases versatility. Red LED models preserve night vision for commercial use, ocean racing or sport-fishing. A blue LED version enhances the boat’s appearance, and a warm white option matches interior lighting and creates a softer hue for more comfort. The Sea Hawk-XL lamps feature a corrosion-resistant, thermal polymer ceramic housing that is completely sealed to IP 67 standard. Its unique design distributes heat away from internal components for longer life. A heavy duty, Swiss-made Grilamid lens provides exceptional resistance to impacts, and both UV and chemical damage. These lights offer low power consumption (<12W) and Multivolt™ circuitry that provides steady, even illumination from 9-33V DC. A 316 stainless steel bracket provides robust mounting and permits vertical adjustment of the lamp without tools. Like every LED lamp from Hella marine, these dual colour floodlights are backed by a full 5-year warranty, for complete peace of mind. Founded in 1925, Hella Marine is a leading manufacturer of LED navigation, floodlight, interior and exterior lighting. Their extensive range is purpose designed and precision manufactured for the harsh marine environment. The company combines over 30 years of design and manufacturing expertise to provide the complete ‘fit and forget’ lighting solution for leisure, commercial and cruise ship vessels. Hella Marie LED lamps are renowned for being highly efficient and extremely reliable. All products are supported with a five-year warranty and are available in over 40 countries worldwide through a network of specialist distributors.